Hi! 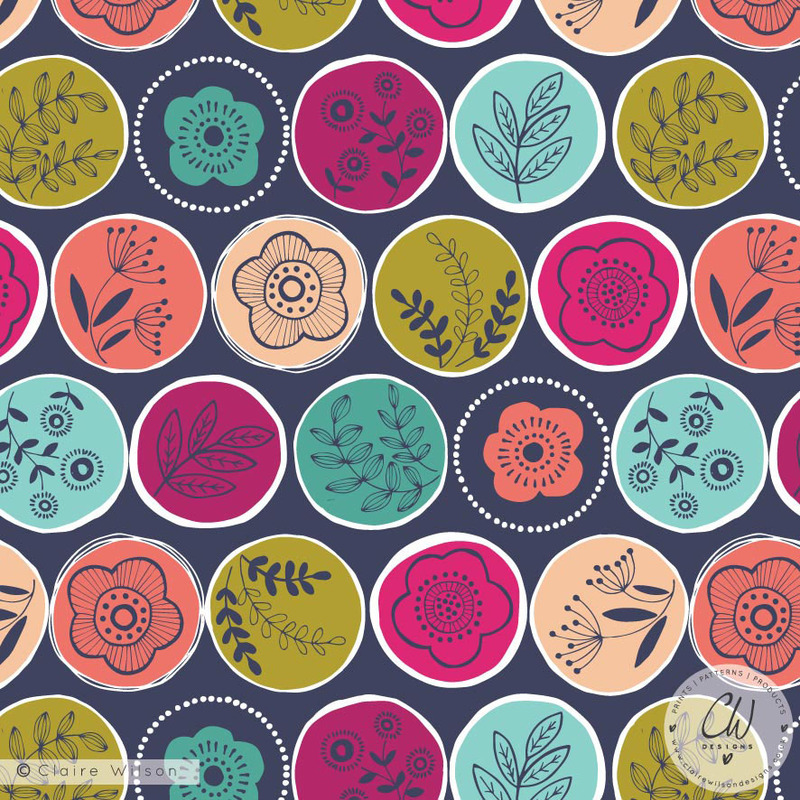 I’m Claire and I’m an illustrator and surface pattern designer, working from a small studio in my countryside home in Northamptonshire, UK. 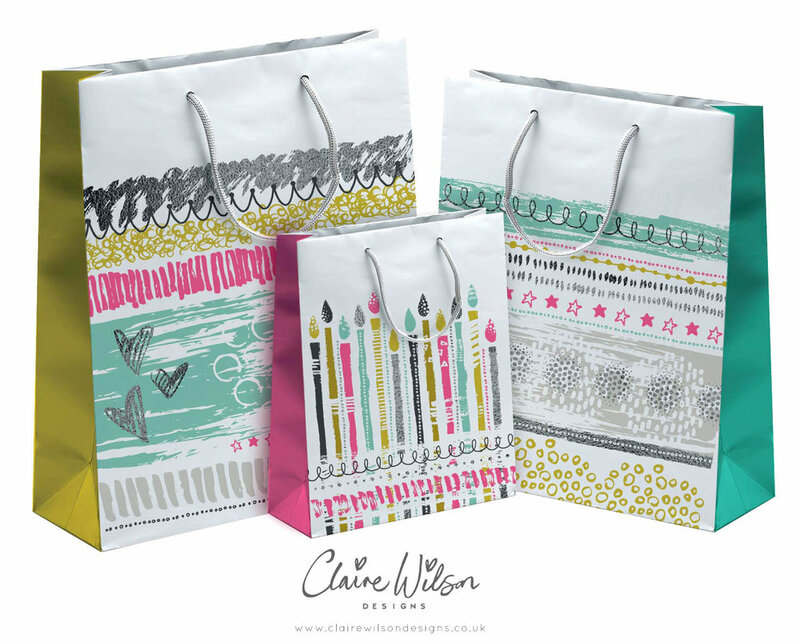 I love to create fun, illustrative and colourful designs to make people smile. 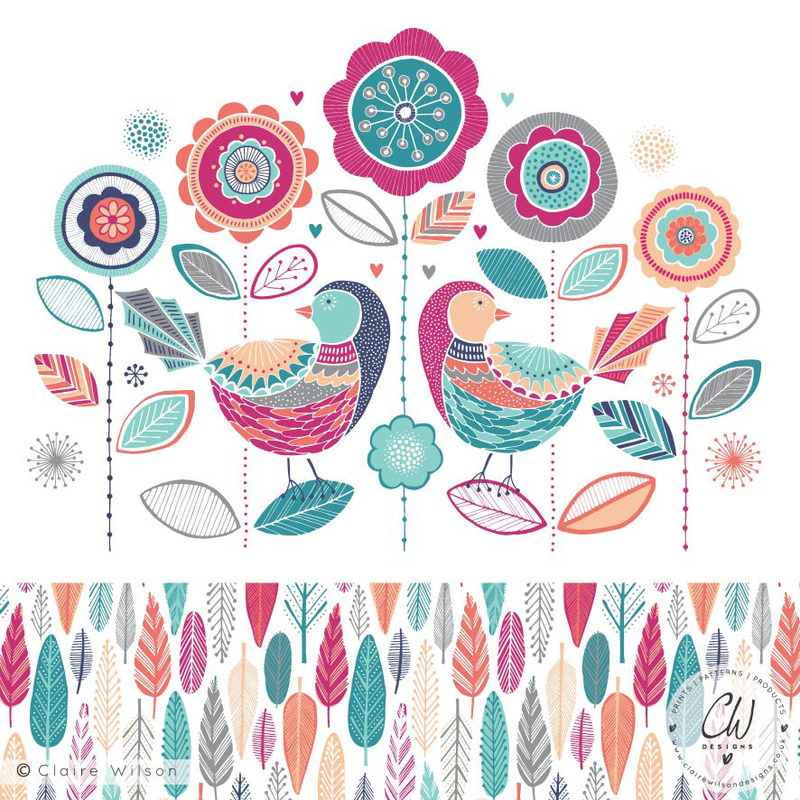 As well as producing my own range of greeting cards and art prints which I sell through my online shops, I also license some of my designs through The Paintbox Art Agency for use on greeting cards. 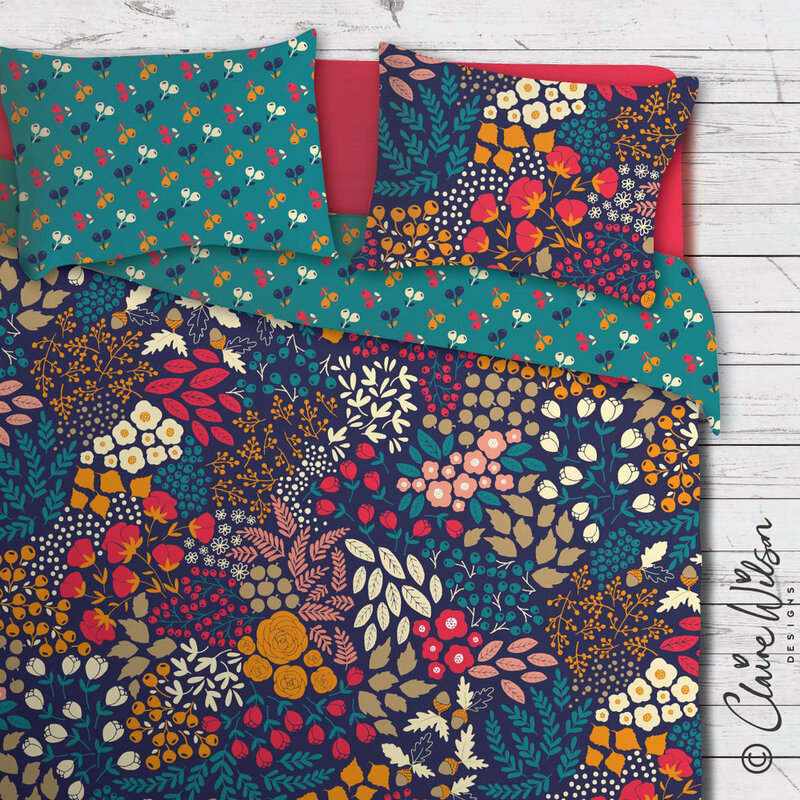 I also work with some UK retailers on a freelance basis across a wide variety of projects, some of which have included bedding, nursery products, children’s bedding and nightwear apparel. 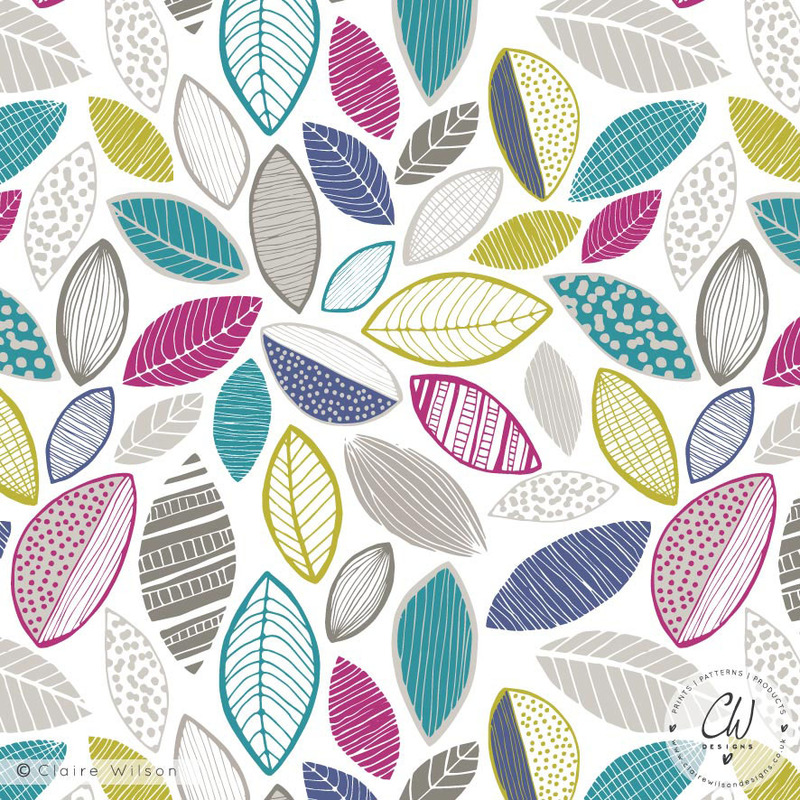 Over the course of the last year, I have completed all four modules of the Art & Business of Surface Pattern Design and was fortunate enough to have been shortlisted as one of the top 8 for the Printsource 2016 Competition. I absolutely love my job and feel very lucky to be able to do what I love every day. IF YOU COULD GIVE YOUR 10 YEARS YOUNGER SELF ONE KEY PIECE OF ADVICE OR AN INSIGHT, WHAT WOULD IT BE? Be strong and just believe in yourself. You will experience a lot of things in the years to come; some bad, some good and some amazing! Stick with your gut instincts, go for it and most importantly, have fun. WHEN YOU FEEL STUCK OR IN A DESIGN RUT, HOW DO YOU GET YOURSELF OUT OF IT AND BACK ON TRACK? I’m getting much better at knowing when to take a break from something that’s just not working, instead of sticking at it and trying to force myself to carry on - it just doesn’t work! I have to take myself away from my desk and do something completely different. Whether that’s exercising, seeing a friend for a cuppa, baking a cake or taking my Springer Spaniel, Bertie, out for a walk in the countryside that surrounds my house. He’s a great distraction and I find a change of scenery can really help to clear my head and allow me to re-focus. WHAT ARE YOUR FAVOURITE DESIGN TOOLS? My Wacom tablet and pen – I can’t use a standard mouse anymore, it just feels so clumsy! I love my retractable pencil and brush pen too, and have several pencil cases full of lots of different drawing pens. I like to work on loose sheets of paper as I personally find sketchbooks really intimidating and feel pressure to make every page amazing which is a bit silly really! Single sheets also make it a lot easier for me to scan in my sketches and work on them digitally. I spend a little bit of time researching and collecting initial ideas and images from magazines or Pinterest, then I put on some music and start sketching! I have music on all the time as I really can’t handle working in silence! The type of music can help to influence and inspire me, and often gets me into a good creative zone. If I’m struggling, often changing the music I’m listening to can really help. I usually start my process by quickly sketching out rough ideas in pencil first to get them out of my head onto paper. I then draw them up in more detail, refining and changing the design as I go. If I’m designing patterns for a new collection, I tend to draw out individual elements first and bring them together in Adobe Illustrator to form a pattern, playing around with colours, composition and scale. 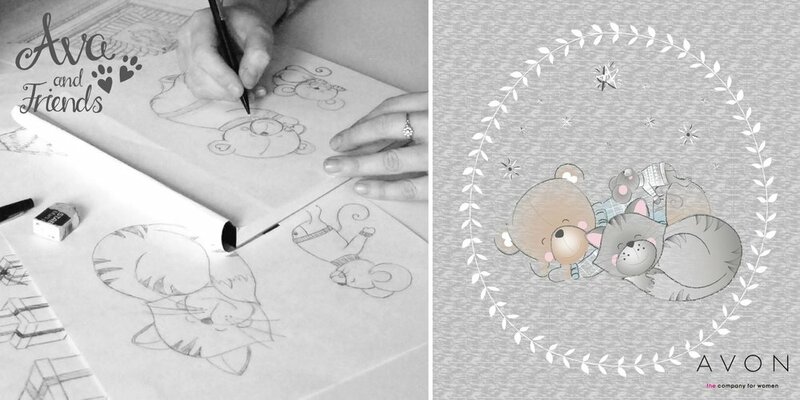 If I’m creating new designs for greeting cards or art prints, I usually sketch out the full composition I want to create and then I use my light pad to trace over my pencil lines and create black ink versions which I can then scan into Illustrator and use the Live Trace tool. WHAT ARE SOME OF YOUR FAVOURITE DESIGN PROJECTS TO DATE? Being a freelancer, I get to work with some great clients and I love the wide variety of projects that I’m asked to work on. It’s always a great feeling when you can see your designs on real life products for people to buy - I never get bored of that buzz! It can also be quite challenging and often pushes me way out of my comfort zone, making me work in ways that I wouldn’t usually work but it’s a great feeling when I manage to achieve what my client needs. 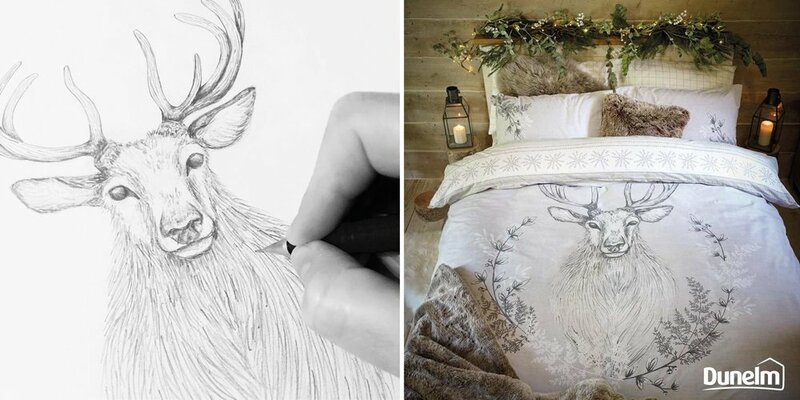 One of the most recent examples of this is a stag bedding design I created for Dunelm. I’ve also been working with Avon over the past year to develop some cute new characters, Ava & Friends, for use on nightwear apparel and homewares. The first phase of this project has recently launched and it’s great to see the characters used across a variety of products. Characters have never been something that I’ve felt comfortable designing, but I’ve proved to myself over the last year that I’m capable of designing them. So the biggest lesson for me is to believe in myself, to say yes to new challenges and to worry about the how later! 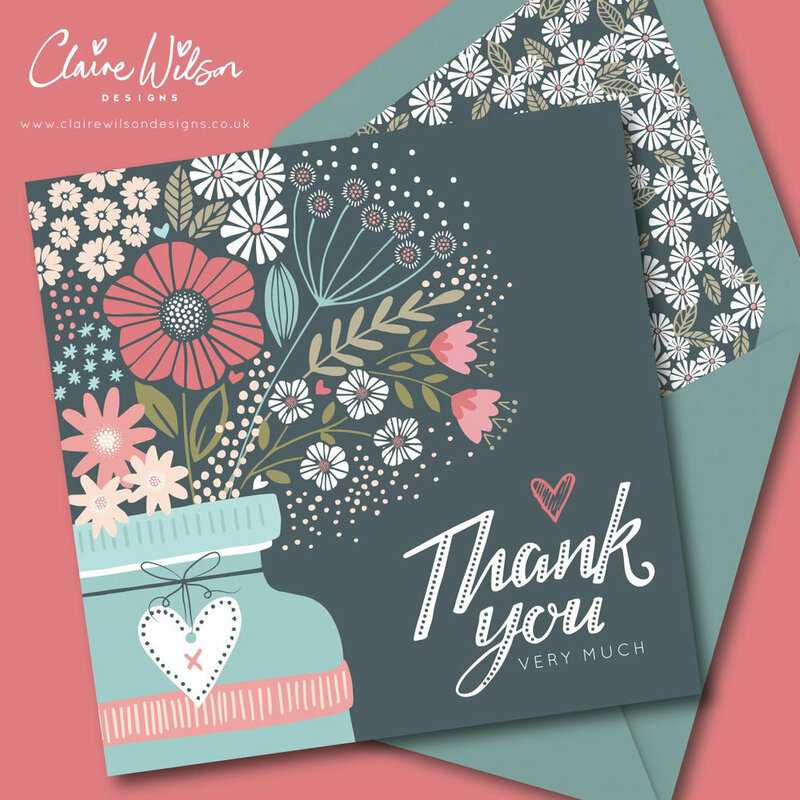 I was also fortunate enough to have some of my designs selected by Cardmaking and Papercraft Magazine during the Make It In Design Ultimate Portfolio Builder Course last year. 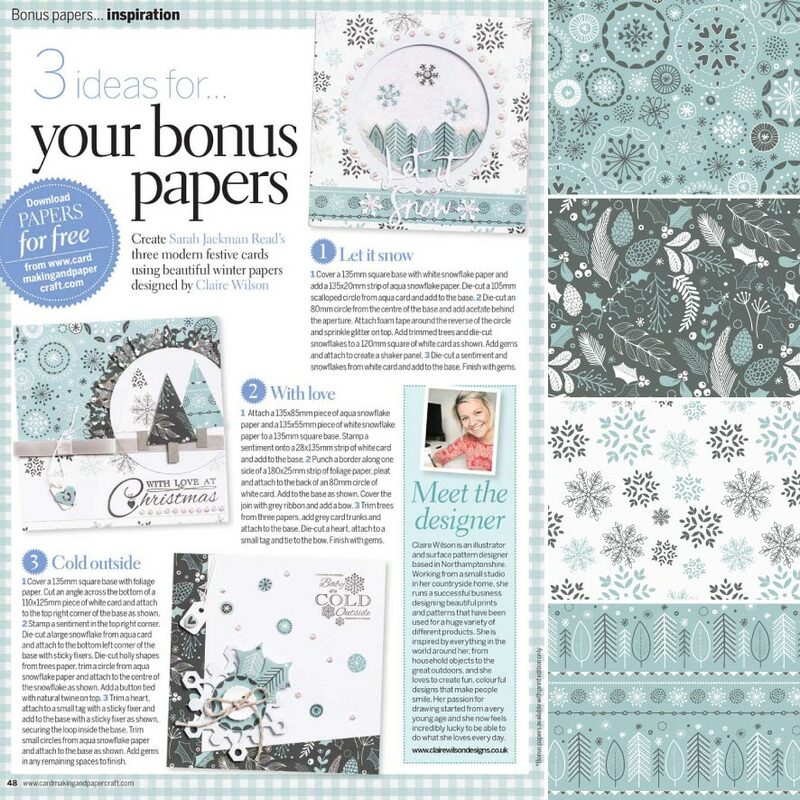 I was really excited to see the designs published in their recent October edition of the magazine and loved the idea that people could make their own Christmas cards using my designs! WHO ARE YOUR DREAM CLIENTS OR WHAT IS YOUR DREAM PROJECT? I can’t resist playing around with product mock ups to see how my designs could be used across different product categories and as a result, there are lots of different areas I’d love to get involved with. 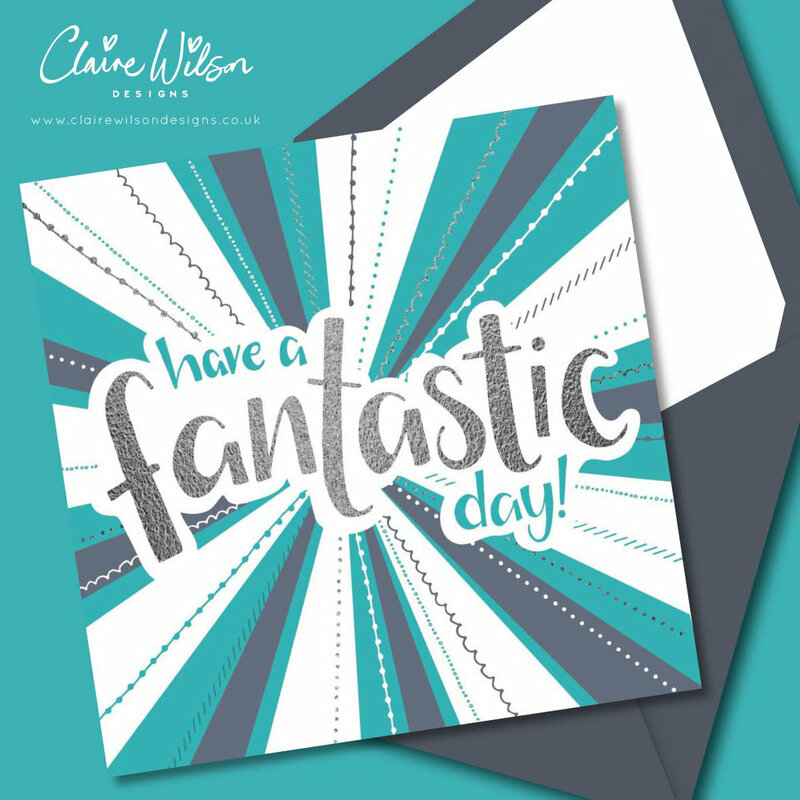 I’m a stationery geek at heart and love to collect cards, notebooks and gift bags, so it would be great to work with Paperchase on a collection of different products. 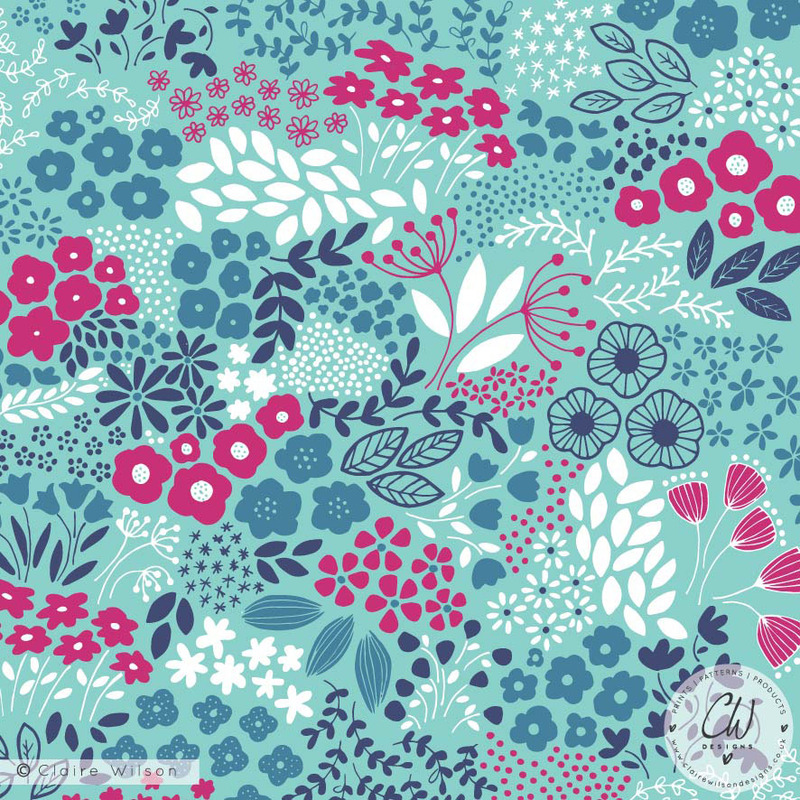 I’d also like to see some of my designs used on fabric so I’d love to work with Dashwood Studio or Cloud 9 Fabrics to create a collection – it’s great to see the wide variety of products that people make with those gorgeous fabrics. THERE HAS BEEN AN ART SUPPLY SANCTION IMPOSED AND DESIGNERS ARE ONLY ALLOWED TO POSSESS 3 ITEMS/TOOLS, WHAT DO YOU CHOOSE? My pen collection, Wacom tablet and Adobe Illustrator. I find inspiration everywhere, from simple everyday household objects to all things bright and beautiful outside. Nature inspires me a lot and being surrounded by beautiful British countryside means I’m never short of inspiration. I find myself naturally drawing lots of flowers and leaves in quite a bright and stylized way, but have recently been trying to develop my hand lettering and character skills too. I spend quite a lot of time doodling and sketching as I find it helps me to unwind and relax. Sometimes those doodles turn into a finished design and sometimes they don’t but it doesn’t really matter, I just love to draw! WHO WOULD YOU SAY THE GREATEST DESIGNER IS? Wow, that’s a really tough question to answer, there are just so many incredibly talented designers out there! I don’t really have one favourite designer that I look to for inspiration but I’m constantly discovering new talent and current designers whose work I love and find inspirational. When I’m long gone, I hope people remember me for being a hardworking, fun and friendly person who loved to create bright and colourful designs that made people smile and feel happy!